Suitable for sensitive skin, this cream is dermatologist tested, hypoallergenic, and it won't clog pores. It leaves my face soft and moisturized. Dry Skin Cream is rated 4.5 out of 5 by 335. Rated 5 out of 5 by Jackie66 from Providing great skin care for generations I started moisturizing my skin when I was 18 years old. I will soon be 67. I have used a wide variety of products in a wide variety of price ranges. Until very recently I was using L'Oreal Golden Balm, and was very satisfied with it. Then I began doing volunteer work with seniors and came upon a lovely lady who is 99 years of age with beautiful skin. When I commented on her beautiful complexion, she told me that she has used Ponds skin cream all of her life, as did her mother before her. I decided to give it a try. I love the texture and the light clean fragrance, and my skin has never looked better! It's soft and smooth feels wonderful. I couldn't be happier. Ponds will now be the only skin cream I use. Rated 5 out of 5 by Bill from The most wonderful product I have been using this product for many years....so many, that I know it must be over 20 years now. I used it once a day after shower and shave in the morning for my face. I am now 72 years old and everyone thinks I look like 50. I attribute this only to this wonderful and inexpensive face cream. Unfortunately, I now spend most of my time out of the U.S. and cannot find it anywhere in the local stores. Yes, there are pond's products in this country, but not the marvelous blue topped moisturizing cream that I consider the finest face cream on the market. 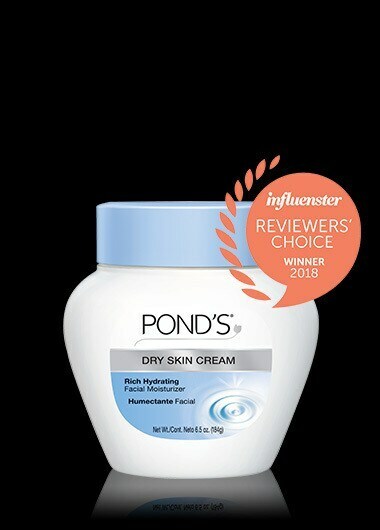 Rated 5 out of 5 by Lauried444 from Terrific Product My Mom used Ponds Dry Skin cream for years, and up until she passed away at age 94, she was getting compliments on her skin. When I was younger, I bought into the "designer" skin products, but because of allergic reactions, I began using Ponds. That was about 30 years ago. I am going on 71, and I am always getting compliments on my complexion. I always tell people about my "secret" - Ponds Dry Skin cream that I buy at the grocery store. Thank you for a terrific product. Rated 5 out of 5 by missy from My dry skin patches are gone!!!! I love this product. I moved to Texas and the water was drying my skin. I had dry patches on each side of my chin and I was constantly scratching them. I thought I eczema. I tried everything. I was preparing to pay $275 to have a dermatologist consultation when someone recommended this product. I figured for $6 I could give it a try. It was well worth it. In less than a week the dry patches stopped itching and began to go away. Its been 2 months and my skin is smooth and clear. No more dry patches. I layer it on thick at night and lay it on thin in the morning. This is truly an awesome product. Rated 5 out of 5 by Cat57 from Best Moisturizer on the market! I probably have spent well over $1000 on department store and TV shopping channel promos "that this is the best and only moisturizer your skin will need!" I would try them, be disappointed and place they all in the back of the linen closet where all moisturizers go to stay. I would always go back to my Pond's! Nothing works better than Pond's that I even use it all over in the winter when the ugly dry skin monster shows its face. At 57 years of age I get so many compliments on my skin that I've finally learned my lesson I'm sticking with my Pond's for life! Rated 5 out of 5 by Renee from Richest & Most Moisturizing Cream I have eczema and my face is super dry & hypersensitive. My skin was getting more itchy, irritated and more scaly with every cream that was recommended by every dermatologist that I went to. I finally decided to try POND'S Dry Skin Cream and I could not believe the great results. After all these years of suffering with my eczema, I have finally found a cream that has soothed, moisturized and healed my skin. I am so happy & thankful for this great product. Dermatologists need to start recommending this product to their patients who have eczema.